Our Lady of Angels was located at 3820 West Iowa Street. It was surrounded by a quiet Catholic parish of about 4,500 families from mostly Irish and Italian backgrounds. They lived modestly in apartments and brick bungalows until after the fire, when many of these hardworking families abandoned the neighborhood, never to return. On December 1, between 1,200 and 1,300 students were sitting through their last hour of classes for the day at the parochial school. The fire started around 2:25 p.m., about 20 minutes before class was going to be dismissed. Like many other schools of that era, Our Lady of Angels was tragically without many of the safety measures that exist today. The 40-year-old building had no smoke detectors, no sprinkler systems, no outside fire alarm and the building had only one fire escape. Unbelievably, the school had passed a fire inspection two months before. By 1958 standards, the building was legally safe. Two students on an errand returned to their classroom and said that they smelled smoke. The teacher took them seriously and after consulting with a teacher in the room next door, both decided to evacuate their students. The rest of the school was not, at this time, alerted to the fire. The two classes left the building – one using the fire escape, the other an inside staircase – and reported to the church, which was on the same grounds. The janitor entered the school building and noticed that it was on fire. He told the parish housekeeper to call the fire department. It was suggested later that she may have delayed calling for a few minutes since an alarm was not received until 2:42 p.m. This was the same time that the building’s fire alarm was also sounded. It was a manual alarm and not connected to the fire department. This was the first warning received by the rest of the school that the building was in danger. It is believed that the fire started in a trash can at the bottom of the basement stairwell. There, it smoldered for a good part of the day and then spread to the stairs, thanks to air from an open window. Once it was ignited, the fire quickly spread and burned up to the second floor, devouring the building as it went. By the time the first fire trucks arrived, the upper floor of the north wing was engulfed in flames. The fire had already been burning for a number of minutes before the alarm went off and more precious time was lost when the fire department trucks mistakenly pulled up to the church rectory, and not the school. The dispatchers had been given the wrong address by the person who phoned in the report. Then, when the first trucks arrived at the school, they had to break through a locked gate to get inside. Inside the classrooms, which were rapidly filling with smoke, the students heard the sound of the fire trucks approaching, but then nothing, as the trucks went to the rectory instead. At that desperate moment, the nuns asked the children to bow their heads in prayer. When the trucks finally arrived, and the extent of the blaze was realized, another alarm was sent out, ordering all available vehicles to the scene. Before it was over, 43 pieces of fire equipment were at the school. When the firefighters arrived, they saw children calling for help from the second-story windows. Since it was the rescue of the children that most concerned the firemen on their arrival, the fire continued to spread and eventually burned off a large portion of the roof. Occupants on the first floor of the school were safely evacuated in orderly fire drill formation but the situation was more difficult on the upper floor, which was now filled with thick clouds of smoke. The fire escape had become unreachable through the burning hallways. The only way out was through the windows and soon, screaming children were plunging to the frozen ground below. The desperate firemen, icicles hanging from their helmets, behaved heroically and managed to save 160 children by pulling them out the windows, passing them down ladders, catching them in nets, and breaking their falls with their own bodies. One rescuer who climbed a ladder up to the building's second floor was Lieutenant Charles Kamin. When he reached the window of Room 211, he found a number of eighth graders were crammed together and trying to squeeze out. He reached inside and, one a time, began grabbing them, swinging them around his back and dropping them onto the ladder. He saved nine children, mostly boys, because he could grab hold of their belts. He was only stopped when the room exploded and the students fell back out of his reach. In one classroom, the children were so gripped with fear that they refused to leave. The teacher instructed them to crawl to the staircase and she pushed them down and out, saving the entire class. Math was being taught in another room when the fire broke out. The quick-thinking teacher ordered the students to pile books around the doors where the smoke could seep in. She told them to put their desks in front of the doors to keep out the smoke and the tremendous amount of heat that was starting to come in. The alarm had not been sounded at that point, so she convinced all of her students to loudly chant in unison that the school was on fire; that way, she told them, they would help by alerting students and teachers in other classrooms who might not know what was going on. By keeping the children occupied, and by quick actions that increased their confidence in her, she was able to keep them calm while they awaited rescue. Some safely jumped to a staircase a few feet below, while others waited at the window for fire department ladders. After all of the students had been rescued, the teacher descended the ladder. Even though this room was heavily damaged by smoke and fire, only one child died. The students in the classroom across the hall were not so fortunate – the teacher and 29 students burned to death. A nine-year-old girl named Margaret Chambers had stayed home that morning with a cold but she hated missing school and begged her mother to let her go for the afternoon session. Her mother, Rose Chambers, agreed and Margaret never returned home. Max Stachura, father of a nine-year-old boy who attended Our Lady of Angels, rushed to the school as soon as he heard about the fire. He was able to save 12 children by either catching them as they jumped or breaking their falls. He couldn’t save his son, Mark, however. He found the boy standing at the window of his classroom and shouted for him to jump. Mark either didn’t understand what his father wanted him to do or was too frightened to jump. He perished in the fire. Firemen groped their way through smoke and fire, searching for children who might be trapped. Hallways and rooms were filled with smoke and gases but the firemen remained, looking in every room for signs of life. They found many groups of children still alive but, unfortunately, they were too late for many. They fought their way into one classroom to find 24 children sitting dead at their desks, their books open in front of them. It was a scene that members of the rescue party would never forget. The scene outside the school was one of chaos. Between children jumping from windows and screams and cries for help, firefighters also had to deal with the terrified parents who began to arrive. They hampered the efforts of the firefighters as they rushed the police lines, hysterically trying to reach their children who were trapped in the building. It took the crew a little over an hour to put out the fire. The blaze had consumed the second-story classrooms, claiming the lives of dozens of children and nuns. For the hundreds of parents and relatives who stood outside, the huge loss of life was soon apparent as cloth-covered stretchers began to emerge from the smoldering building. A long line of ambulances and police squadrons slowly collected the bodies and took them to the Cook County Morgue, where family members could identify them. Confusion and mystery made the tragedy even worse. Many parents had no idea if their children were dead or alive. Some of them were discovered standing in the street outside the school. Others were given shelter in nearby homes. However, many parents had no choice but to search the seven hospitals to which the injured were taken or, worse yet, to wait in the grim line at the county morgue. Chicago was stunned by the appalling loss of life and word of the disaster spread around the world. In Rome, Pope John XXIII sent a personal message to the archbishop of Chicago, the Most Reverend Albert Gregory Meyer. Four days later, Meyer conducted a mass for the victims and their families before an altar set up at the Northwest Armory. He called the fire "a great and inescapable sorrow." Nearly as tragic as the fire itself was the fact that no blame was ever placed for the disaster. In those days, there was no thought of suing those responsible (the Catholic Church, which ran the school) for the conditions that allowed the fire to happen. Outwardly, the families accepted the idea that the fire had been simply "God's will," but it cannot be denied that a number of those involved left the Church, their faith as shattered as their lives. No one dared to challenge the Church over what happened and life moved quietly on. 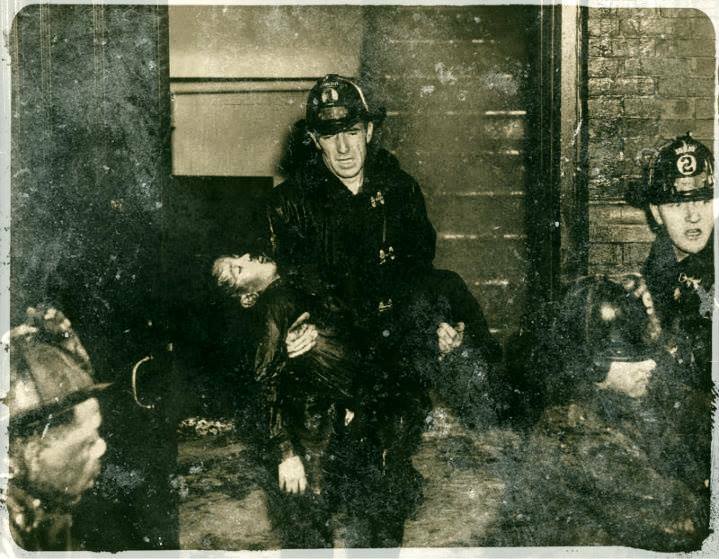 But in January 1962, the fire was news again when police in Cicero questioned a 13-year-old boy about a series of fires that had been set in the city. When they learned that he had been a troubled student at Our Lady of Angels at the time of the fire, their interrogations took another direction. The boy's mother and stepfather hired an attorney, who recommended that the boy submit to a polygraph test. In the interview, polygraph expert John Reid learned that the boy began starting fires at the age of five, when he set his family's garage alight. He had also set as many as eleven fires in buildings in Chicago and Cicero, usually by tossing burning matches on papers at the bottom of staircases. This was exactly how most believed the Our Lady of Angels fire started and so Reid pressed him harder. The boy denied starting the fire at first, but test results indicated that he was lying. Later, the boy admitted that he had set the blaze, hoping for a few extra days out of school. He said he hated his teachers and his principal because they "always wanted to expel me from school." His attendance record had been poor and his behavior was described as "deplorable." In his confession, he said that he had started the fire in the basement after leaving his classroom to go to the bathroom. He threw three lit matches into a trashcan and then ran upstairs to his second-floor classroom, which was soon evacuated. When Reid asked him why he had never told anyone about setting fire to the school, the boy replied, "I was afraid my dad was going to give me a beating and I'd get in trouble with the police and I'd get the electric chair or something." Reid turned the confession over to the police and the boy was placed in the Arthur J. Audy Juvenile Home. Charges were filed against him, but after a series of hearings that ended in March 1962, Judge Alfred Cilella tossed out the boy's confession, ruling that Reid had obtained it illegally. Also, since the boy was under the age of 13 at the time of the fire, he could not be tried for a felony in Illinois. He did charge the boy with starting the fires in Cicero, and he was sent away to a home for troubled boys in Michigan. The boy's identity has never been released, but there are those who know it. Despite pleas from surviving family members of the Our Lady of Angels victims, it has never been publicly released. Despite the passage of time, the fire has never been forgotten. A new parish school was constructed on the site in 1960, but it was closed in 1999 because of declining enrollment. The only memorial to the victims of the fire is located in Queen of Heaven Cemetery in Hillside, where 25 of the victims are buried. It was constructed from private donations in 1960 and to this date, no official memorial to the fire has been erected. For those who survived the fire, or lost friends or family members to the blaze, the Our Lady of Angels disaster remains a haunting memory that has been impossible to shake. To this day, they continue to hold reunions and services in memory of those who died, and many of those with connections to the fire tell strange stories and personal experiences with those who died in 1958. One woman recounted how her parents were relieved to see that she and her brother had survived the fire when they found them on the street outside the school. Her mother later told her that, shortly after arriving, she saw her son running from the building and heading toward his parents. He had a big smile on his face, thrilled to have escaped the burning school with his life. The parents and son became separated in the confusion and after the fire was out, they were unable to find the boy. Hours later, it was learned that he had died in his second-floor classroom and had not left the school at all. Until the day she died, the woman’s mother was convinced that she saw her son outside the school that day. Others with a first-hand connection to the fire have also spoken of encounters with loved ones who did not survive. Mothers claimed their children came to visit them and some who were children at the time of the fire stated that they were consoled by perished brothers and sisters, who stayed only briefly before moving on. Some visitors to the fire memorial at Queen of Heaven Cemetery say that they sometimes smell the strong presence of smoke nearby. Are such stories merely imagination, or perhaps wishful thinking? No one can say for sure, but there is no denying that the Our Lady of Angels Fire remains one of the most poignant and heart-breaking in Chicago’s history and continues to be a wound that will be healed for many years to come.